Leave the ordinary behind and aspire for nothing less than this breathtaking modern architectural masterpiece. 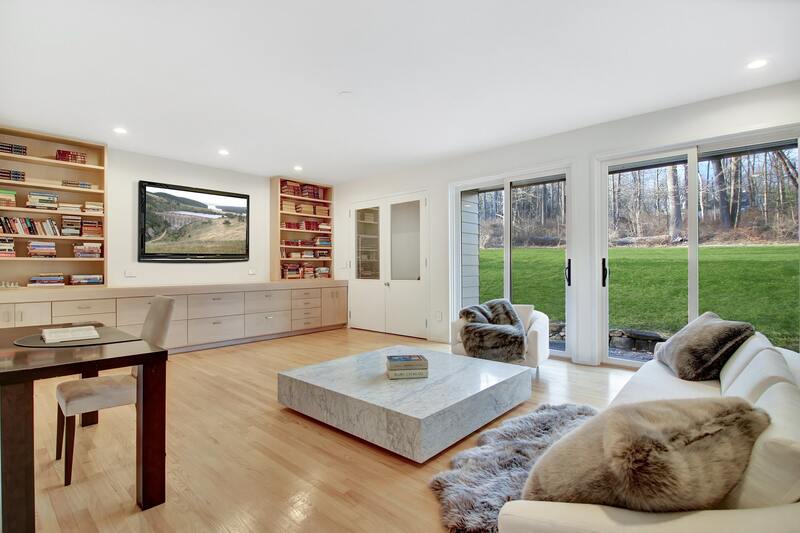 Custom designed and recently renovated from top to bottom with only the finest materials, this exclusive 5 bedroom residence on three acres is truly one of a kind in the heart of New Vernon. As you wind up a long private drive, the home creates a commanding presence and does not disappoint. Boasting an open concept floor plan with soaring ceilings, new walls of windows and a center atrium with Japanese garden, it is a home perfectly designed for today's modern lifestyle. Another compelling reason for living in New Vernon? Real estate taxes for this home were $16,400 in 2017, less than half when compared with surrounding towns for a similarly sized home. 5 Bedrooms, 4.1 Baths, 4 Car Garage, expansive property, modern open concept floor plan, soaring ceilings, center atriums, ultra-sophisticated finishes, luxurious Porcelanosa baths, stunning Gourmet Kitchen by Pedini, an enviable Master Suite with nearby Study and sophisticated systems. In this virtual tour you will be able to walk through the home, see the floor plan, view additional photos of the property, arrange furniture using the floor planner and even view an area map. 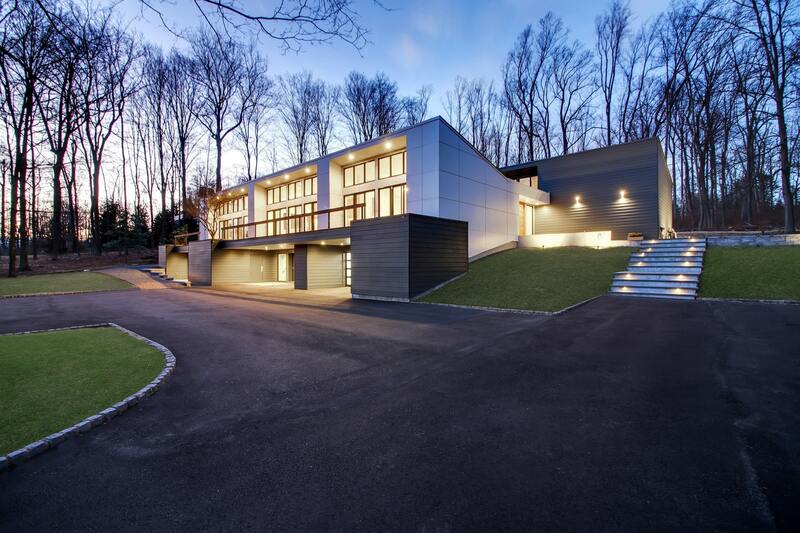 Experience the upscale lifestyle of this renovated New Vernon residence where modern architecture and luxury meet. This one-of-a-kind masterpiece incorporates spectacular details that home buyers desire today including grand open spaces, soaring ceilings, designer custom finishes, an enviable master bedroom suite, luxurious baths, an expansive property and a lower level that can accommodate an assortment of tastes and activities. A soaring entry foyer boasting high ceilings, wide entries and built-in storage, combined with an open floor plan and a soft palette of neutral colors set against sleek flooring, was designed with today's home buyer in mind. An open concept main living area featuring floor-to-ceiling windows overlooking the lush property makes this the perfect home for those who appreciate architectural interest at every turn. 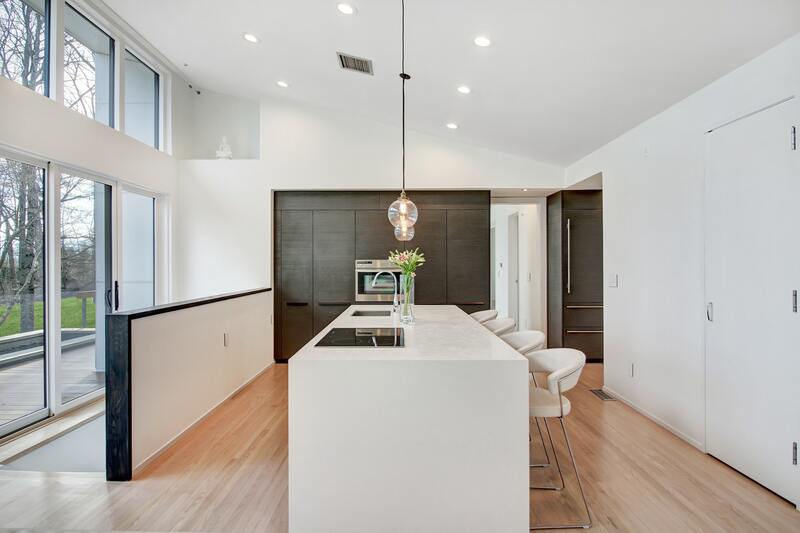 The architectural interest flows into the stunning Gourmet Kitchen where an expansive center island with embossed quartz countertops is the focal point. A culinary hub, the kitchen features substantial cabinet storage custom designed by Pedini. The gourmet kitchen boasts professional appliances including a Miele cooktop, ceiling mounted exhaust vent, Miele convection oven, Miele dishwasher and two walk-in pantries. For convenience, there is also a dumb-waiter to effortlessly transport groceries from the lower level garage. All spaces in the home continue a modern yet warm and inviting white pallette-based design. 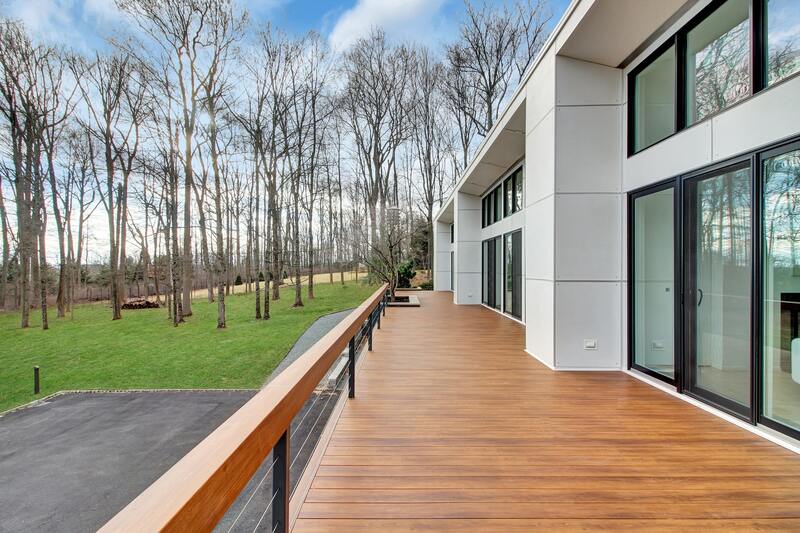 Soaring ceilings and minimalist architecture are the centerpieces of this home. As you walk further through the Kitchen, you find a banquet-scale Dining Room with walls of windows on both ends and doors to the exterior. 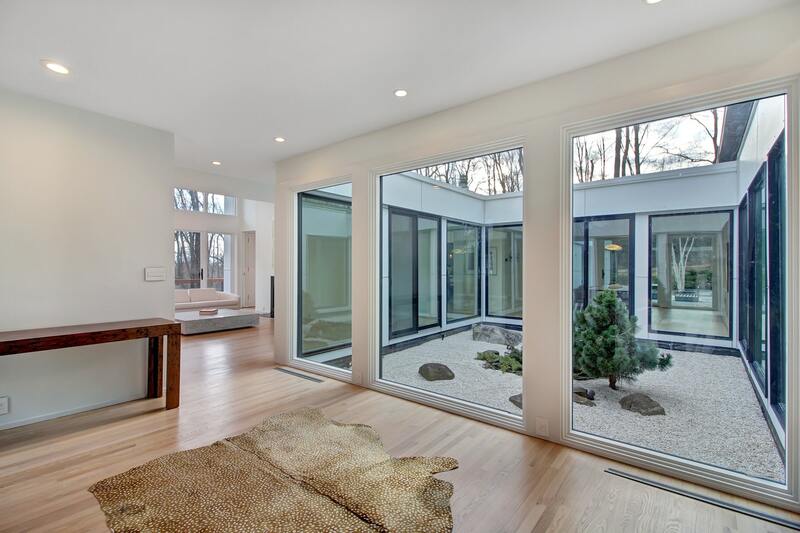 The focal point of this room is the stunning Atrium in the center of the home with Japanese garden and pond. 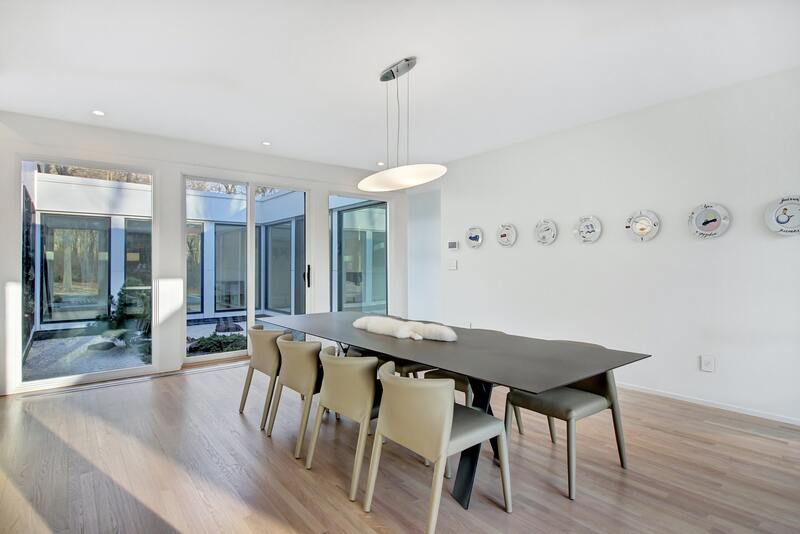 Energy efficient LED designer recessed lighting throughout contributes to a warm glow. The master suite is an oasis in and of itself. Walking from the main hall through a large door, a vestibule ensures that the room is completely tucked away from the rest of the home. In this vestibule, homeowners are greeted with a dressing room outfitted with custom cabinetry and a substantial master bath. Featuring only the finest marble, custom wood cabinetry, free-standing tub and oversized walk-in shower, all future hotel rooms will be a disappointment. Continuing through the vestibule, the true piece-de-resistance is revealed. The bedroom's focal point is a wall of windows and doors to a private stone patio. Also featured is a wood-burning fireplace with stacking stone facade. This master suite is sure to please even the most discerning of buyers. Also on this level reside four additional generously sized bedrooms. All baths have been masterfully renovated, featuring Porcelanosa cabinetry and tile. The bedrooms offer the height of modern comfort. The grounds are breathtaking with expansive sweeping lawns and privacy all around. The custom terraces, patios and decks across the front, middle and rear of the home offer delightful views of the lush park-like property. From morning coffee to late night dinner parties, there isn’t a more perfect place to start or finish the day. *The information above is deemed to be accurate but is not guaranteed and is subject to change.